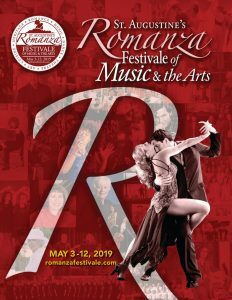 Romanza’s fifth annual dance talent review… A dozen dance troupes and dance schools collaborate to bring you one spectacular showcase of talent! 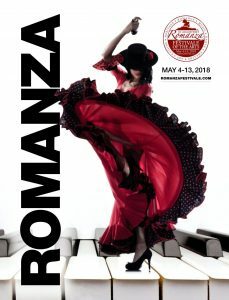 Romanza Festivale presents Dance Kaleidoscope, showcasing all styles of dance from aerial dancing, belly dancing, tap dancing to ballet and ballroom styles. DANCE KALEIDOSCOPE is a fun, eclectic sampling of the art of dance as practiced in the St. Augustine region. Performers in this lively show run the gamut from highly professional tap, hip hop and ballroom dancers to skilled, talented students from public and private institutions engaged in the preparation of future professionals, to those equally skilled and talented who dance exclusively to nurture their bodies and souls. The program demonstrates how thoroughly dance is entrenched in our sense of community, our sense of self, and our artistic life in St. Augustine. 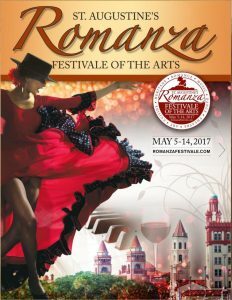 Romanza Dance Kaleidoscope was conceived and presented for the first time in Romanza Festivale 2015. 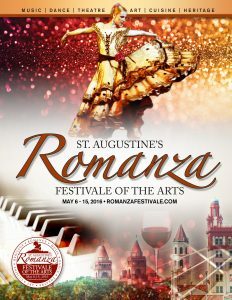 The show was a resounding success and this year, Romanza is presenting the third Dance Kaleidoscope featuring dancers from St. Augustine, Palm Coast and Ponte Vedra. The show will be directed by Judy Woodruff, acclaimed university dance instructor, choreographer and local dance teacher.